The interest of the mineral gathering begins with quartz and at last, it ends with quartz. Once upon a time, Hanasaka-jisan and Lilianite appeared on Tsubakihara mine. In the interest of the fishing, it is said that it begins with the crucian carp and then that it ends at the crucian carp in Japan. In the interest of stone, beginning with the crystallized quartz will be sure. Then, at last, By what does it end? As expected, I think that it is quartz. Rock Cristal on host rock. As for the specimen size, the width is about 30 cm. Rock Crystal may be beautiful surely but I don't have the ability to analyze it. 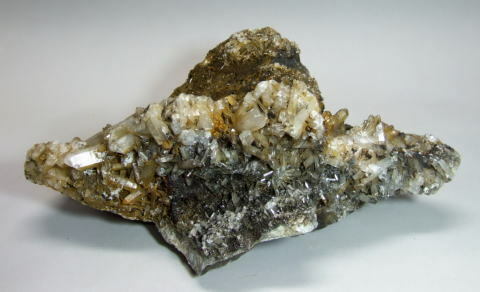 Therefore, I like the Rock crystal with a host rock, because it has some at least origin information. However, the quartz which I like is a lode specimen. 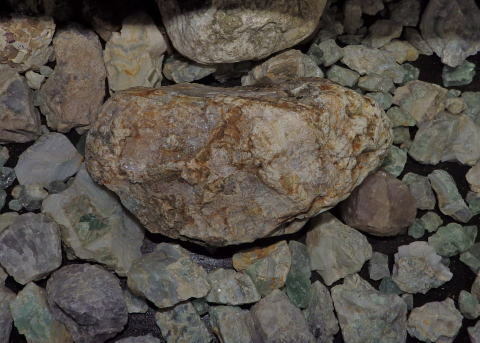 Silver ore. Yabu-mine, Hyogo Prefecture, Japan. 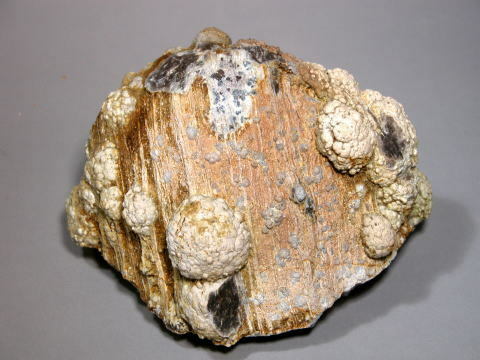 In Japan, this ore is called "Silver black 銀黒(ginguro)". When I attempt to enlarge and view on the surface, as for the black part, I can see that natural silver is contained. Because silver was easy to discolor, I made a glass plate stick onto the specimen surface for a discoloration prevention measure. I observed it at present about whether it discolors or not . I think that I should make sure to be able to permanently preserve a specimen. 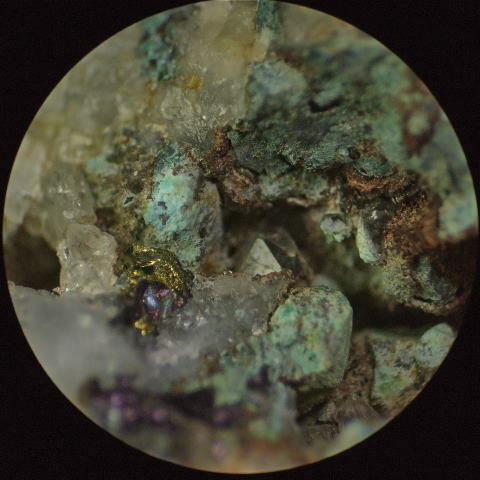 Silver ore,　銀黒(ginguro). Kinbara-mine, Hyogo Prefecture, Japan. 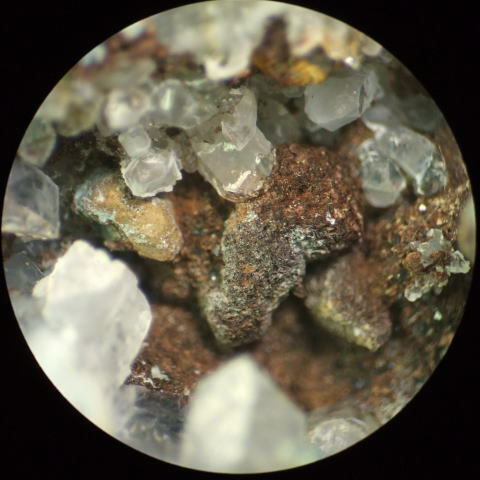 Like these specimens, as for most of the Hydrothermal mineral deposits , quartz is related roughly. 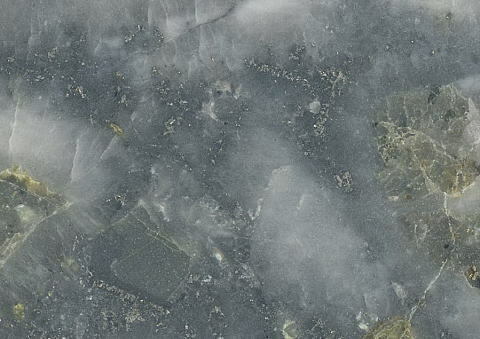 The mineral collection ends with quartz, beginning with Rock crystal. Tsubakihara mine. Here is a main pit on Tsubakihara mine. 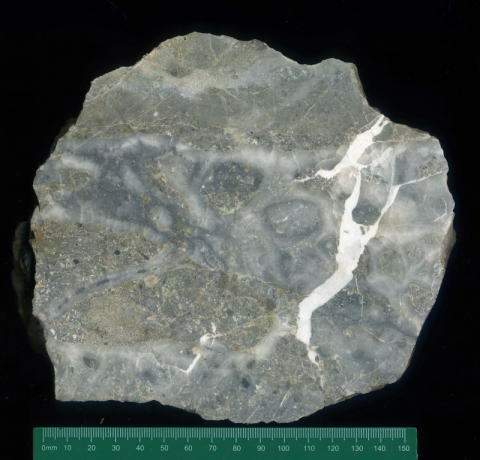 Was Lilianite produced from here? 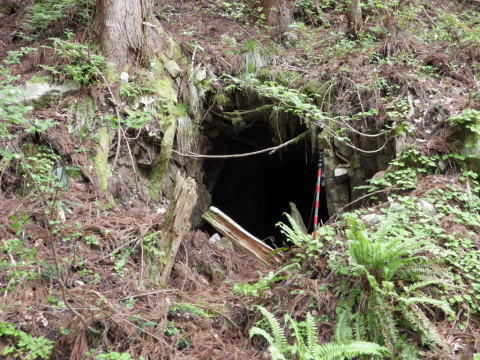 There is the Hirase mine which mined big molybdenum lode. 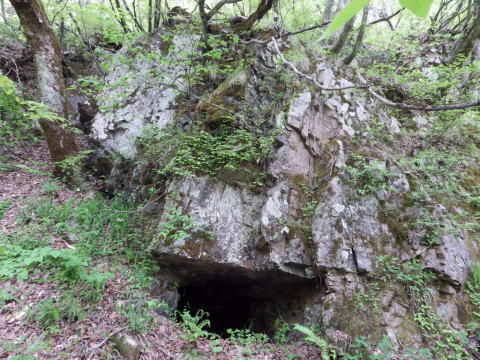 In addition, there are some small molybdenum mines in Shirakawa-mura area. The one was Tsubahara mine. When entering in the 1900s, the Japanese military needed much molybdenum. Because, the army tried to make the monster guns in order to reinforce armament. Therefore, the army tried to mine molybdenum in any small mineral deposits of Japan. Hanasaka-jisan appears certainly in the place where there is desire of the human being. 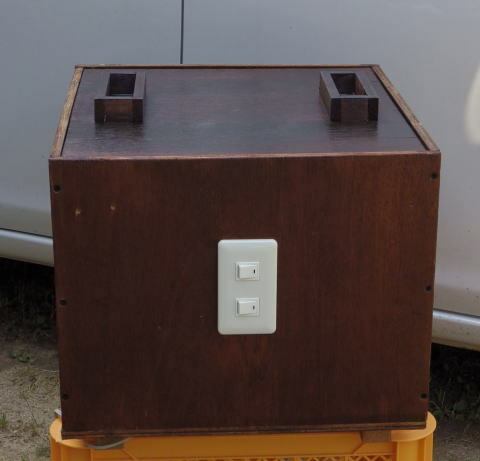 Hanasaka jisan decided to prepare the stage facilities which himself appeared into Tsubakihara, because there were the thin quartz lodes which contained molybdenite in granite there. Then, Hanasaka-jisan set about the mine's facilities from the main pit. He sapped the thin quartz lode of the outcrop. Resources are something that will someday be exhausted. Moreover, after a while, the lode was exhausted. He dug a thin quartz lode outcrop in one more place by the trial. As for the result, as expected, the lode was exhausted immediately. Because the quartz lode was too small, by his scattering high quality ore on the other mine, it wasn't possible to use the way of camouflaging like a big lode. Hanasaka-jisan decided to use a few difficult methods. It is this method. Hanasaka-jisan began to dig a tunnel from here. However, the direction at the tunnel wasn't heading for the center on the mountain. The direction had an about 45 degree angle from the centerline. 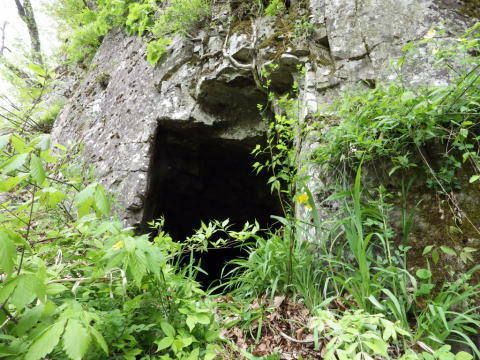 In other words, this tunnel seems to go along the surface of a mountain a little.I think that this tunnel continues tens of meters, because, the bump, it should bump the big lode of the molybdenum. 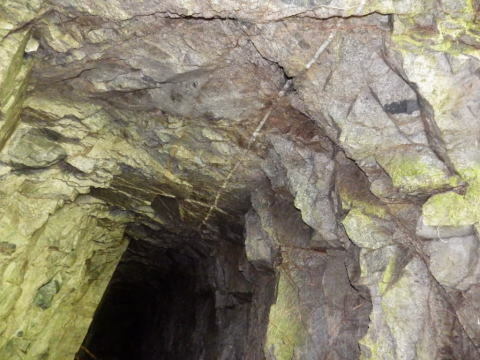 Moreover, the front whole surface of the tunnel is filled with the ore of the molybdenum. 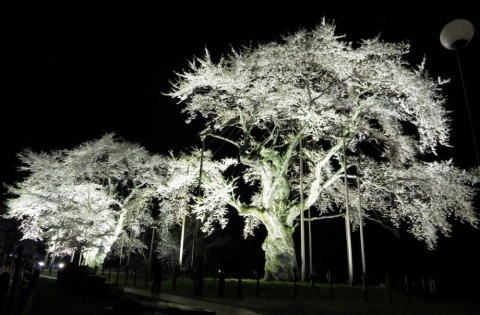 It will have surely been a wonderful view like the full-blown Shokawa cherry tree. Shokawa cherry tree to be lighting up. Shokawa Town, Takayama City, Gifu Prefecture, Cyubu region, Honsyu Island, Japan. As for Tsubahara mine, too, the cherry tree should become in full bloom in this way. However for the flower at the cherry tree, falling of cherry blossoms in full bloom is quickly. Also, if digging only several centimeters of this big lode, the tunnel will have passed a lode immediately. They needed the very delicate work to show the thin lode of only several centimeters to the big lode at the end of the tunnel. Therefore, when the big lode appears in end of the tunnel, when the flower at the cherry tree is in full bloom in other words, it is necessary to make this fraud succeed. Here is another quartz lode. However, he didn't sap from the outcrop. He dug a tunnel from the place which left a lode by tens of meters. 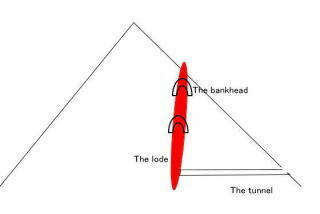 The direction of the tunnel crossed at right angles with the running in a lode. 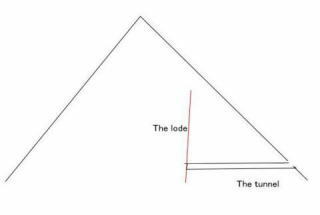 The running in this lode is perpendicular to the direction of the tunnel correctly.. Then, he makes sure that he digs out so as not to destroy a thin lode and that the tunnel ends on the lode when the tunnel reaches a lode . At this time, the flower at the cherry tree became in full bloom and then, Hanasaka-jisan's stage acting reached a climax. That the con man deceived an army in Japan which the greed set up will have been easy. Also, the existence which helped this fraud was " the incompetent scholar who supported a government ". 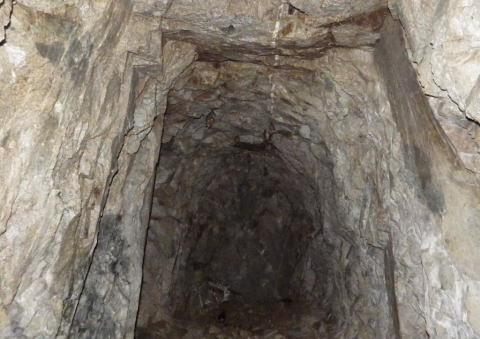 Usually, it is a way of mining a lode on the mine. The way of mining a lode on Tsubakihara mine. 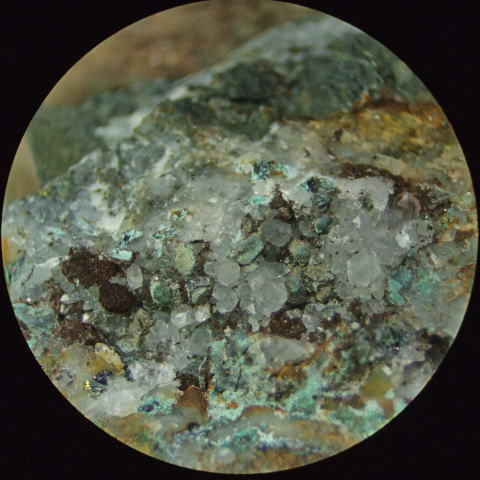 By the way, the Lilianite was produced from the Tsubakihara mine. I thought that the lode which the Lilianite was produced was the tunnel of this photograph. 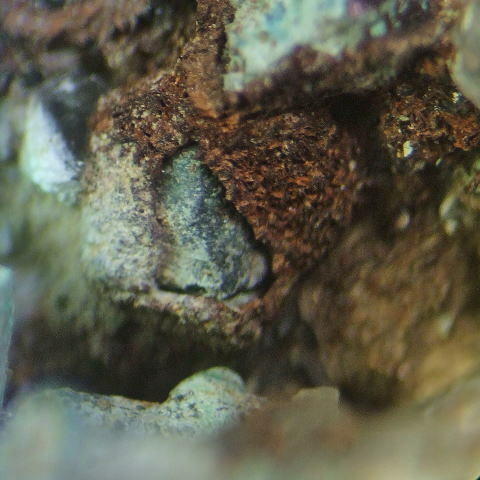 However, I thought that Lilianite didn't produce it from this lode. Because, on this thin quartz lode, the specimen with that size should never produce. 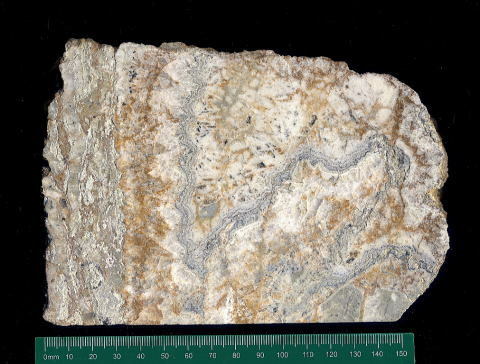 Morever on this lode, the molybdenite of the fico is only seen. If following, from where did you produce a Lilianite? Therefore, I thought that there was not a reason why the Hanasaka-jisan this in. It will have produced a Lilianite from the place except these tunnels. Therefore, it may not be possible to say to produce Tsubahara mine about the Lilianite. The Lilianite may be being one of the flowers with the cherry tree which Hanasaka-jisan scattered. If making a fact, the price of the Lilianite of Tsubahara mine is too high. I saw the status of the Tsubakihara mine and created the story of this Hanasaki-jisan.